The Animals is a story of a friendship gone wrong. That’s what I got out of it, anyway. Along with some beautiful writing. And, these questions: Can you outrun your mistakes? For how long? Is it possible to re-invent your life? Is it possible to re-invent it without looking back over your shoulder for the rest of your life? And, what kind of life is that? What you have come for is death. You might try to convince yourself otherwise but you know in your heart that to do so would be to set one falsehood upon another. In the end there is no denying what is true and what is only some thin wisp of hope that clings to you like hoarfrost on a strand of wire. At least you have learned that much, although you are loath to admit it just as you are loath to come down the mountain, down from the animals, to confirm what you already know you will find. It’s 1996 and Bill’s life is good. He has his animals, his girlfriend, her son, and he is respected in the community for what he does. But, his life hasn’t always been this way, and he is just waiting for the day it all comes back. He must have known it would. When Bill was young he had a brother who was like a father to him, a mother who liked to watch Wild Kingdom with him every Sunday night, and he had a good friend named Rick. He and Rick ran somewhat wild, but it didn’t get really bad until after Bill’s brother died. Young Bill moved to Reno with Rick where they spent all their spare time partying and gambling. When Rick was away in prison for a year, the gambling got to be a real problem for Bill, and things all went downhill from there. It was scary to read about how quickly and easily things can get out of control. [gambling] And somehow he felt like he was in control of what was happening – even though he also knew that the idea of it was absurd and impossible – and yet he could not remember any other moment in his life where he had felt such a thing. Not ever. Here, at least, there was a sense of possibility. Outside the glass doors of the casino was only a narrow path that he already knew led nowhere at all. Now, after another 13 years in prison, Rick has come back to set the record straight. At this point in the book, things get suspenseful. What is Rick capable of? Will everything Bill has worked for be ruined? On the other hand, why should Bill be living the good life and not Rick? How do you decide who is the better man? Do you judge them by what they’ve done in the past, or how they live their lives now? Bill feels as though he’s done the right thing by getting away and making something with his life. Rick feels abandoned and betrayed. There’s an interesting contrast of the two boys/men. Rick is the confident one; the survivor, the fighter, loyal to the end. “You take care of your people.” Bill is the follower; goes along with Rick, doesn’t know what to do with himself when Rick isn’t around. “As for himself, he had no idea what he was doing. No idea at all.” What does this mean for them when things get tough? What about years later when Rick threatens everything Bill has accomplished? How far should you go to “take care of your people”? It’s easy to like one character better than the other, but when you think about it all from beginning to end (once you’ve gathered up all the pieces) it’s not so black and white. The animals play a big part in this book, maybe metaphorically more than anything else. But, even Bill’s work at the Wildlife Sanctuary is questionable; he is saving the animals who would otherwise have died in the wild, but are they happy there? Or should they be let free to live or die as they are meant to? One reason he is reluctant to let them go is that they helped save him from his troubled past, and he wants to return the favour. 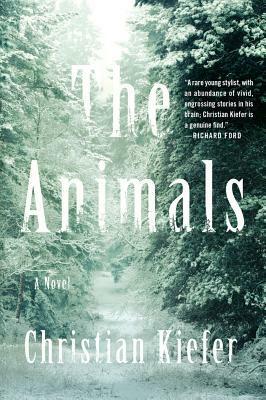 Before reading the book I thought the snowy trees on the cover was so pretty, but now they make me shiver, thinking about what went on inside those cold, dark woods. Proof that the author did his job. One more thing I want to know (if you’ve read this book): if you were Grace, what would you have done? The issues this book raises sound pretty enticing and suspenseful. I heard about it when it came out but haven’t gotten to it yet. One for the TBR. I was surprised by the questions I had while reading this book. I still don’t know what I think *should* have happened. A good one to discuss. Yes, I would have to say there is hope. Grace doesn’t play a huge part in the book, but at one point she has a big decision she needs to make, and it mad me wonder what I would have done in her place. I read the Kirkus review of this book, too, and thought it sounded interesting. And if that pretty cover is now making you shiver, then the author has indeed done his job. The book starts out on the slow side, so I wasn’t sure at first what to think, but because of all the good reviews I’ve been seeing, I kept going. I was surprised how much I liked it, how beautiful the writing is, and also that I really couldn’t figure out what was going to happen. Sounds lovely. ‘some thin wisp of hope that clings to you like hoarfrost on a strand of wire’ is just a beautiful image. The writing really was beautiful. It almost seemed odd at times – parts of the story are pretty heavy – crime, drugs. blood, death. Mixed with moments of raw beauty. So glad to hear you enjoyed this one! I totally agree with you about the writing – it really stuck with me, too. Is the thing that haunts Bill’s past a spoiler, of did I miss it? Something about this book just makes me shiver. Seems too dark for me!